In biology, stress is any environmental or physical difficulty or burden that provokes or causes a reaction from an organism. Stress response is actually beneficial as it supports survival, forcing organisms to change and adjust to environmental conditions. 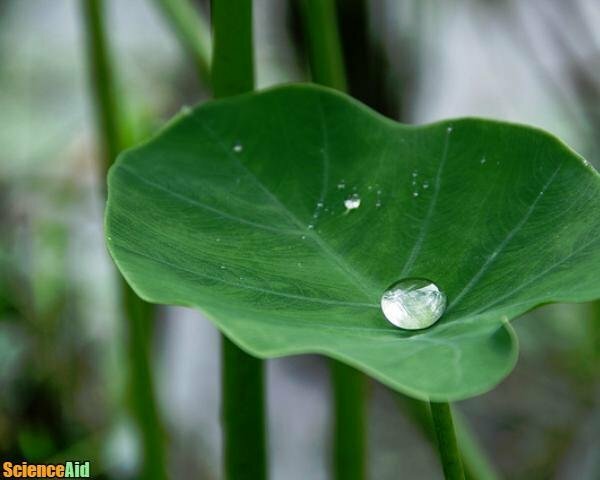 For example, during a drought (a stressful situations for plants) many plants are able to conserve water by closing microscopic pores in their leaves. The extended loss of water caused by the drought instigates stress responses in the plant that support its survival. Increased energy due to the liver releasing glucose. Often a rise in adrenaline levels. These changes are termed stress response and are apparent in both humans and animals. While the biological actions involved in this process are complex, the primary stress hormone involved is cortisol, which increases in stressful situations. 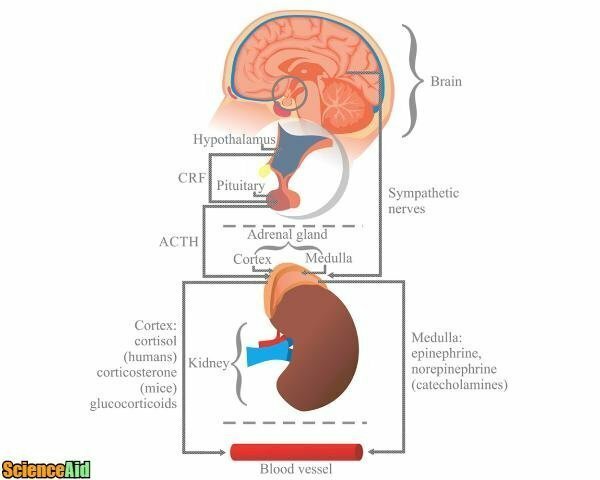 The engagement of the hypothalamus, pituitary and adrenal glands is the hub of this response and often referred to as the hypothalamic-pituitary-adrenal axis. 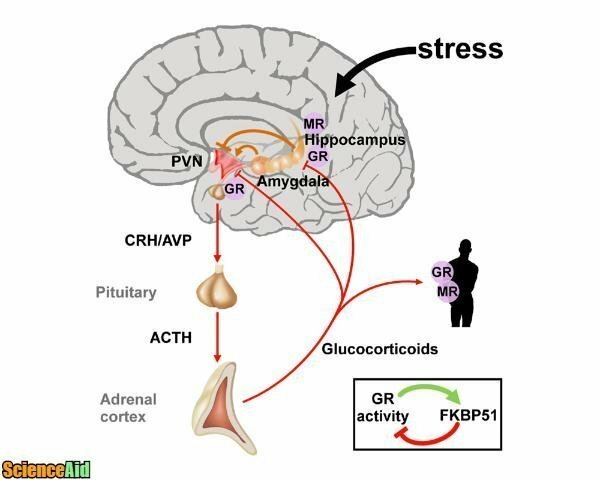 The hypothalamic-pituitary-adrenal (HPA) axis is an important driver of stress response and anxiety behavior. A series of peripheral and central nervous system responses regulate blood level of glucocorticoids, the activity of several brain regions, primarily the hypothalamus (a brain region at the base of the brain), and hormone release by the pituitary gland (just below the hypothalamus). This creates a feedback loop of excitation and inhibition on behavior and chemical output of the brain, pituitary gland, and adrenal cortex of the kidney. Glucocorticoids in the brain and pituitary gland are significant indicators and regulators of stress and anxiety and are synthesized in the body even before birth, beginning on day 50 of gestation in humans. In mammals with a shorter gestation, this begins even earlier. For example, this initiates on day 14.5 in mice . 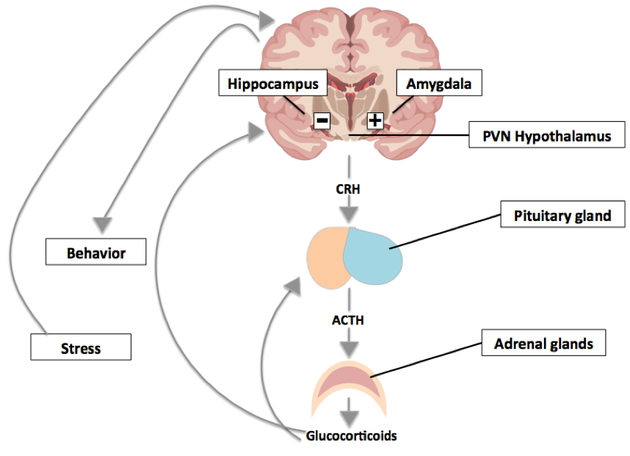 Stress response hormones are essential for embryonic survival and normal behavioral development and neurodevelopment, particularly in the hypothalamus, amygdala, and  where they regulate anxiety, stress, and fear responses . In addition to glucocorticoids, vasopressin (AVP), a hormone, has a significant role in stress and anxiety behavior. Also, AVP and corticotrophin-releasing hormone (CRH) are both synthesized and released from parvocellular neurons in the paraventricular nucleus of the hypothalamus (PVN), and together stimulate proopiomelanocortin (POMC) and adrenocorticotropic hormone (ACTH) release from the pituitary . In fact, AVP circuitry stimulates ACTH release in rats, mice, and humans . There are several more studies in animals that provide valuable information about these pathways as well. In one such study, AVP receptor knockout mice had reduced anxiety , showing the importance of this receptor in behavior. Additionally, we know that CRH initiates 5-HT . When CRH is injected into the prefrontal cortex of mice, it increases anxiety behavior by enhancing 5-HT receptor-mediated signaling. CRH also amplifies 5-HT signaling in cultured cells by utilizing rapid receptor internalization and recycling to increase surface 5-HT receptor expression . 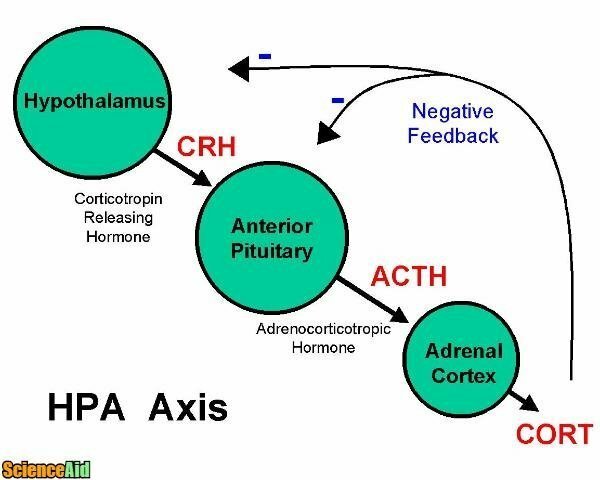 Not surprisingly, the HPA axis also further interacts with other steroid hormones in the brain and gonads. One such instance is testosterone and estradiol (an estrogen) levels in the blood. These hormones are inhibited following stress in both male and female rats . Additionally, testosterone can lower anxiety by androgen receptor (AR) activity. Multiple studies show that female mice and male mice with dysfunctional ARs have increased anxiety . 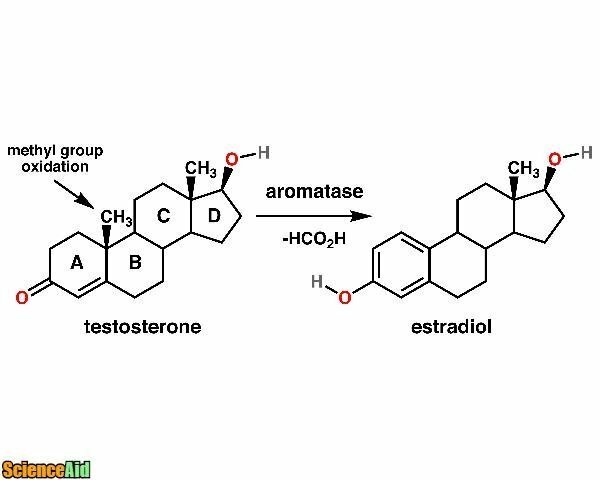 Estradiol also plays a complex role. In female rats circulating estradiol enhances corticosterone (similar to human cortisol) levels, whereas females without estradiol have a blunted response. This research shows us that through binding of their receptors, estradiol, and testosterone operate in a feedback loop with circulating stress hormones to further regulate the HPA axis, stress response, and anxiety. Because multiple receptors and hormones are involved in these stress and anxiety pathways, regulation of this machinery is easily and frequently disrupted by chemical and environmental factors. Stress response and anxiety are necessary adaptations for survival, but dysfunction of the mechanisms results in altered behavior and psychiatric disorders. MLA (Modern Language Association) "Stress_Response." ScienceAid, scienceaid.net/Stress_Response Accessed 23 Apr 2019. Chicago / Turabian ScienceAid.net. "Stress_Response." Accessed Apr 23, 2019. https://scienceaid.net/Stress_Response. ↑ Arnett, Melinda G., et al. "Behavioral insights from mouse models of forebrain-and amygdala-specific glucocorticoid receptor genetic disruption." Molecular and cellular endocrinology 336.1 (2011): 2-5. ↑ Chen, Chieh V., et al. "New knockout model confirms a role for androgen receptors in regulating anxiety-like behaviors and HPA response in mice." Hormones and behavior 65.3 (2014): 211-218.